A community that stands united wins ! Immigration Naturalization SERVICE (“DHS,” “USCIS,” “ICE” and other agencies) CAUSED suffering for the community for 17 years, and wasted millions upon millions of taxpayers’ dollars in this witchhunt ! 40. So all the great things Zahid has done all his life does not get to define his “good moral character” , but some incident in a different country on a different continent on the other side of the world over 22 years ago in which he actually was the only victim, is taken out of context, reported inaccurately, selectively spun in arbitrary direction with prejudice, frivolous & inadmissible (according to the laws & rules of evidence), has no relevancy & out of jurisdiction gets to define Zahid’s character? 44. Before the recording of the July 2010 deposition of Zahid started, why did the dominating and oppressing defending counsel (at that time Asst. US Attorney General for WA, Frank Wilson) make derogatory & insulting comments about all women in general? Was the coercing defending counsel attempting to instigate Zahid to agree with the oppressor (Asst. US Attorney General for WA, Frank Wilson) and then use those comments out of context during the interview to assassinate Zahid’s character, as they have persistently and unsuccessfully attempted to do throughout? 46. What was the intentional purpose of the dominating defending counsel (Asst. US Attorney General for WA, Frank Wilson) in forcing Zahid to remove his protective eye-wear when counsel knew in advance, and were also reminded by Zahid and his attorney, about sensitivity to light? 47. What was the sinister motive of the defending counsel’s (Asst. US Attorney General for WA, Frank Wilson) intentional bullying attitude of yelling and screaming and banging fists on the table and files during that deposition, when defending counsel knew well that Zahid has sensitivity to sound? 48. Why did the defending counsel (Asst. US Attorney General for WA, Frank Wilson) lose control intentionally when Zahid had to take his prescribed pain medications, etc. during his deposition? What was Frank Wilson trying to achieve with all that drama? 49. During Mrs. Chaudhry’s July 2010 deposition for so many hours when Mrs. Chaudhry broke down and cried at numerous occasions due to the intentional and well-thought out verbal torture and mind games, why was the defending counsel behaving in that merciless and atrocious manner? 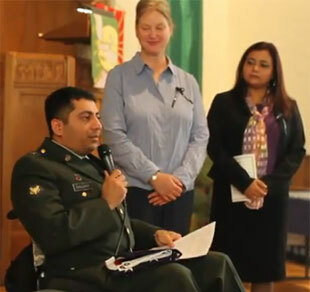 Posted in Uncategorized	| Comments Off on Muhammad Zahid Chaudhry is a decorated, disabled U.S. Army veteran who sustained injuries in the military that have left him in a wheelchair. Despite his honorable military service and despite being married to a US citizen for 17 years, Chaudhry family, friends and concerned citizens of the World are standing in solidarity and bearing witness for Zahid’s right to remain home. End the unconstitutional CARRP policy which delays, denies and looks for reasons to deport rightful naturalization applicants from Muslim or perceived-to-be Muslim communities. See the reports, watch the videos – check out the NEWS tab of this website for information on CARRP – “Muslims Need Not Apply” – then, write to your Congressional leaders for their support to end this illegal, unethical, immoral and unconstitutional policy. The below “Participate” action is temporarily inactive. This action automatically sent 4 free faxes to two American Federal Senators (Washington State), the Secretary of the Department of Homeland Security and the Director of Immigration and Customs Enforcement asking them to do all they can to Keep Zahid Home. We thank those who participated in this action. AmericasVoice may soon re-activate this action and we will notify our websites visitors to join in and participate. Send a free fax now. Click ‘participate’ to get started. Ask Washington Senators Patty Murray and Maria Cantwell; Janet Napolitano, Secretary of the Department of Homeland Security; and John Morton, Director of Immigration and Customs Enforcement (ICE) to do all they can to keep Zahid home—in the country he loves and has served: in the U.S. Army and as an unpaid volunteer with the American Red Cross, Habitat for Humanity, and the Fire Department (where he carried a pager and responded to emergencies 24/7) — with his wife and his family, friends, neighbors and fellow veterans and soldiers. Lip service at its best. April 1, 2011 from Chaudhry family: Senator Maria Cantwell’s Washington, D.C. office & Seattle office just had a conference call with the Chaudhrys & they are very hopeful that it will get resolved soon to Chaudhry family’s satisfaction. Thank you Chris in Seattle office & Claire in Washington, D.C. office!! May we all have a great weekend. Senator Maria Cantwell gave all the people present her personal commitment and said “Let’s work on this in earnest & get this matter resolved.” Then she said,”It is between David & Goliath, and I’m on David’s side,” as she pointed to Zahid. Posted in Uncategorized	| Comments Off on Protect Honorable, Decorated, Disabled American Veteran From Harassment, Threats & Intimidation!